I have a little friend. That friend's name is Rascal. Rascal is a squirrel. True story. Rascal lives somewhere around the historic Boise house that I work in. I see her daily. About a year ago (when my office was downstairs), she used to perch on my window sill and say hello every day. One day, I walked outside, clicked my tongue a couple of times (it's our method of communication), and she came over to say hi. I gave her a few peanuts that I set out in a little dish for her to eat. Over time, she started getting more and more friendly, and now she eats out of my hand. These pictures were just taken this morning. She was waiting on the front porch for me when I got to work. In fact, she's probably still out there waiting for more peanuts. Also—In the third photo Rascal was testing my finger for it's food-like properties. Yes. She totally nibbled my finger. Weird. Oh my gosh! I need a rascal in my life!! SO cute! Great photos! So cute! I wonder what happened to her ear, poor thing! Wishing you a happy weekend Aunie! 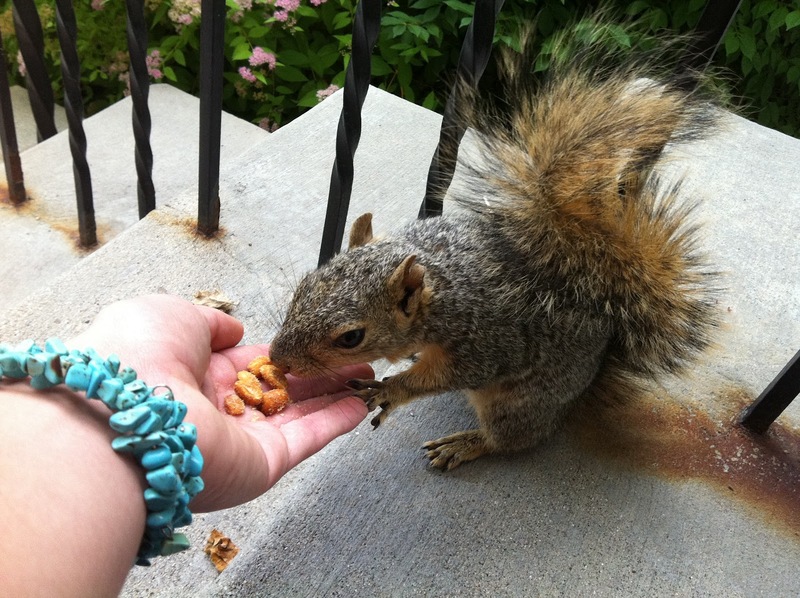 I wrote about my fear of squirrels just this week in my sponsor info for artsy anthropology! I've run into some very angry squirrels in my time. This one seems adorable. awwww that is seriously awesome!! so cute!! You're like a modern day Snow White! Now you just need to teach Rascal how to help you around the office. Such a cute little guy! Thanks for hosting the link up too! (Maybe next week we could co-host? So very very cute and sweet! At San Jose State we had two species of squirrels on campus and one of them (that look like Rascal) was super-duper friendly. They would approach you just like this. So one day I was sitting around eating some cheez-its, and a particular squirrel kept coming over so I gave him Cheez-its until we had finished off my bag. So cute! I'm amazed this one let you take pictures though. I'd think the noise would scare him away! 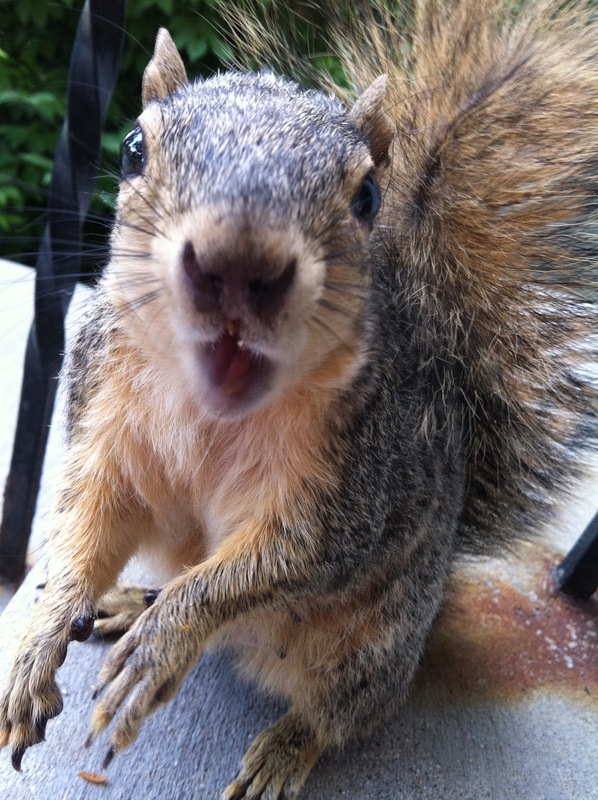 Squirrels are seriously adorable...but the ones around here are not that friendly! I had a pet squirrel when I was little and it used to watch tv on my shoulder! One of these days, I will have to find the pictures to prove it. Rascal is a cutie! are you feeding her honey roasted peanuts!? 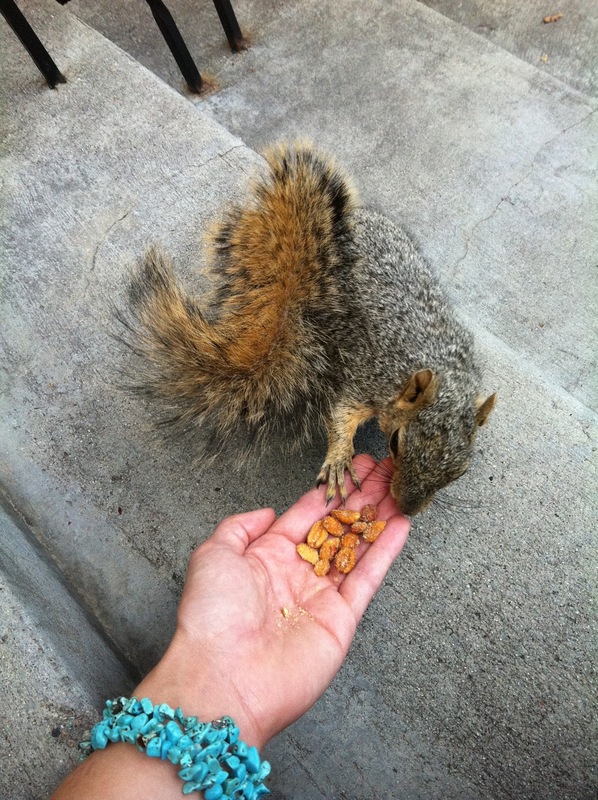 I love squirrels and have always wanted to get that close to one- people think I'm crazy though! THAT is incredible!!! Kudos to you for approaching a sweet wild animal like this, that's so so cool and commendable, wow. Love this post, so glad you shared this with us...still can't believe it. And it's the same squirrel?? That last picture of Rascal had me cracking up, so funny! My little squirrel buddy got hit by a car right in front of our sidewalk :( made me so sad. you are a squirrel whisperer! maybe even an animal whisperer...i mean, you've caught lizards with your bare hands. this is ridiculously cool and i really want to feed the ones i see around the local university's quad. 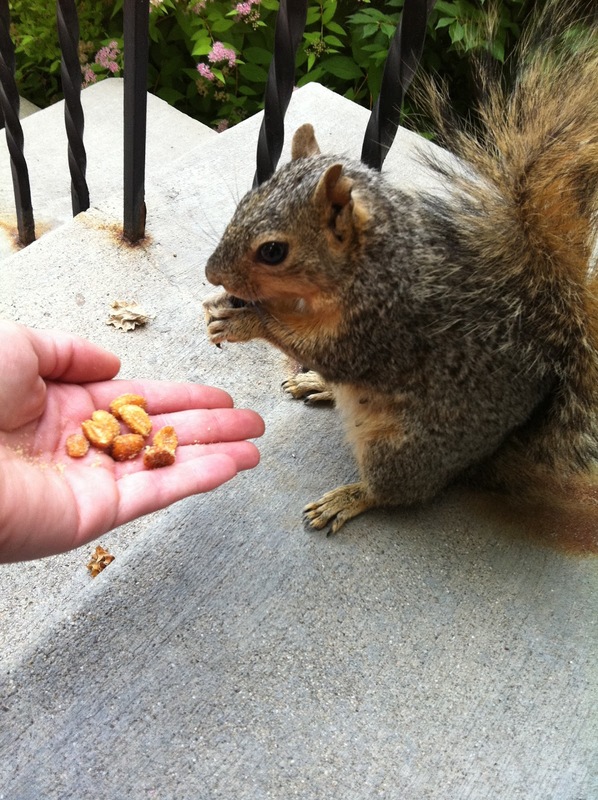 even though some look like they've had enough peanuts for a lifetime - haha! 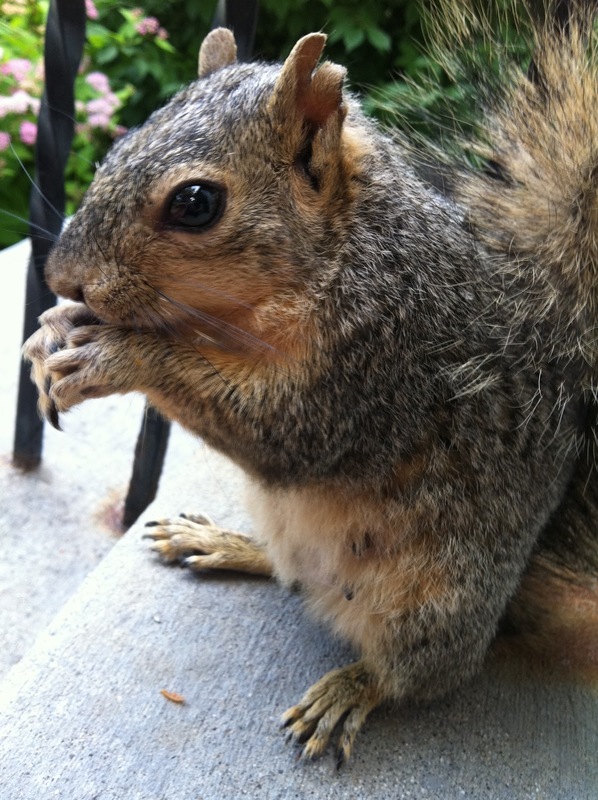 I'm now determined to befriend a squirrel...the pictures were so stinkin cute! just the six of us. My Big Fat Bearded Dragon. What is Just Because Friday? Colleen Samantha... Unique, Faithful, Blessed.